The Long Textured Edgeless Mops are made from strong, durable knitted polyester, eliminating contamination from breakage and deterioration common with cottion and rayon string mops. Cleanroom laundered Long Textured Edgeless Mops are made from a continuous tube of 100% polyester knitted fabric looped to form unique ribbed, twisted strands that will not shed or break. Designed for use with aqueous solutions containing cleaning agents and disinfectants. Works well with existing string mop hardware however, we highly recommend a down-press wringer for proper liquid extraction. 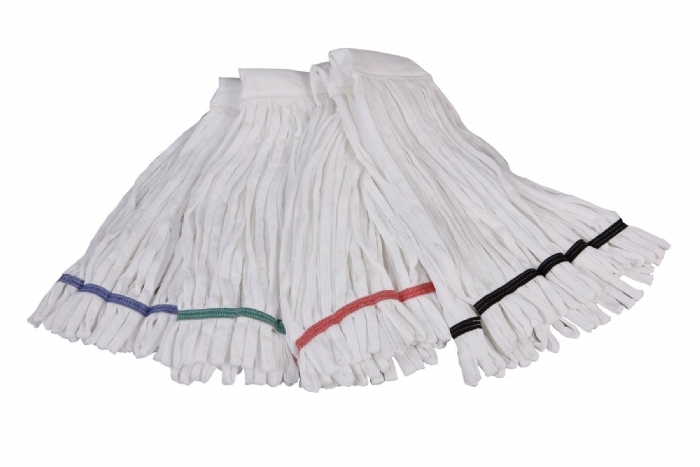 Colored tail bands allow designation of mops to speciific areas with the same facility. Eliminates cotton mop fibers that can be a food source for mold and bacteria. Last up to 10 times longer than traditional mops. Can be laundered or processed in commercials washers. Designed for lab clean up and process area cleaning. Rugged polyester construction is ideal for tough cleaning tasks.